Home » China 1897. The dying coolie by Isabella Bird Bishop. Perhaps because benevolence and charity are the objects of guilds, there is very little of the personal element in either. Personal kindliness and care for he sick and dying do not characterize the people of China. If a man is sick to death he is of no more use, and why should time and care be wasted on him? 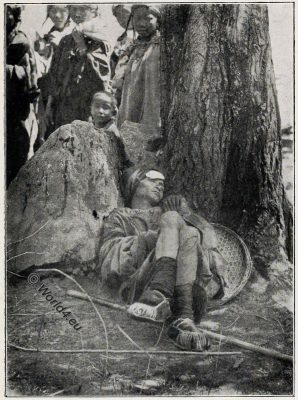 Source: Chinese pictures: notes on photographs made in China by Isabella L. B. Bishop. Publ. : in New York by C. L. Bowman 1900. Isabella Lucy Bird (Bishop) was a British female traveller of the Victorian era. Isabella Lucy Bishop (born October 15, 1831 in Boroughbridge Hall, Yorkshire, died October 7, 1904 in Edinburgh) was a British travel writer, photographer, and naturalist. She was the first woman to be elected Fellow of the Royal Geographical Society. Her last major enterprise led her to Korea and China in 1897, where she traveled along the Yangtze River and Han Jiang, a tributary of the Yangtze River. This entry was posted in 1897, 19th Century, Asia, China and tagged China scenery, Historical Chinese costumes on 8/15/17 by world4.